A Day In Big Sur — Christine Celine. 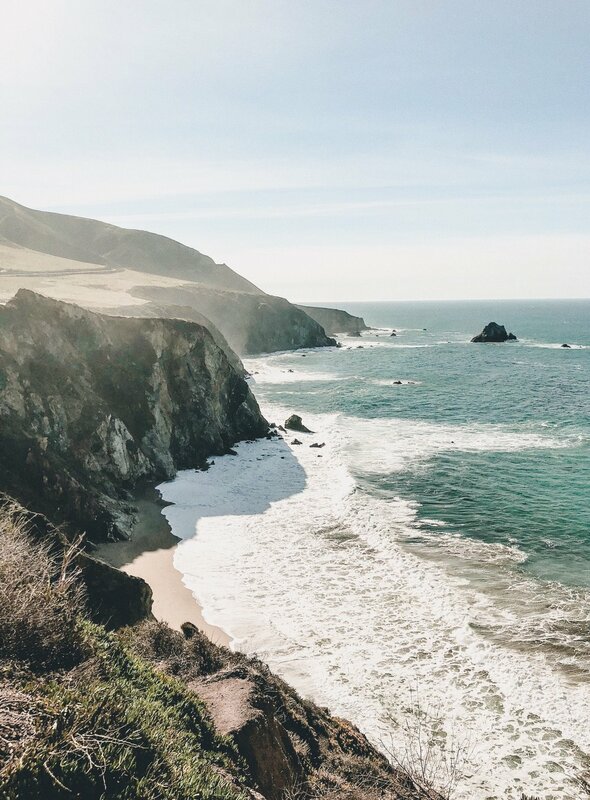 Come follow us through a day in Big Sur. 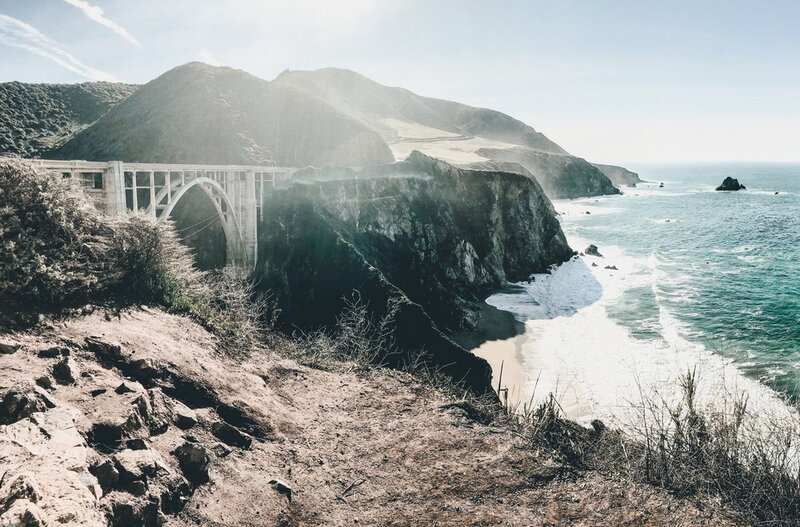 Last minute vacation plans and spontaneous decisions led my family down the Pacific Coast Highway for a day in Big Sur with some of the most spectacular views California has to offer. We decided to cruise down the coastlines and take in some views and hike a little before heading back to our home north of Los Angeles. Unfortunately due to the mudslides, we couldn't drive all the way down and had to go back up to Monterrey before heading east. Follow along on YouTube to see where we went or down below for a detailed description! This is a popular site to visit for the breathtaking views and geometric architecture of the bridge itself. Take some time to bask in the sun and stop at this scenic point while heading southbound on the Pacific Coast Highway from Carmel Valley. As of 01/2018 you can only access the bridge from the north due to the mudslides. Hopefully this will change come summer 2018. Another great spot with tons of camping, hiking, swimming and picnicking options for the whole group. Entry for cars is $10 per day and the hours are from sunrise to sunset. Hike up Buzzards Roost for a great workout among the famous Californian redwoods and enjoy some time by the Big Sur River. As always, be sure to check the current opening status and conditions before planning your visit. This place was unknown to us until my mom decided to stop at the neighboring restaurant to view the menu. The views at rocky point are picturesque and if you're up to climbing some boulders, you can get some great photos of the ocean here. I loved this hidden gem and highly recommend stopping here for lunch or dinner. With a four hour drive home, we did not have time to make a stop here. This state park is further south from Pfieffer Big Sur State Park and offers some gorgeous views of waterfalls and the ocean. Choose between a short 1/2 mile hike to McWay Falls or a more challenging 2-mile circuit that leads you to some stunning views. I highly recommend making a stop here if you have more time! 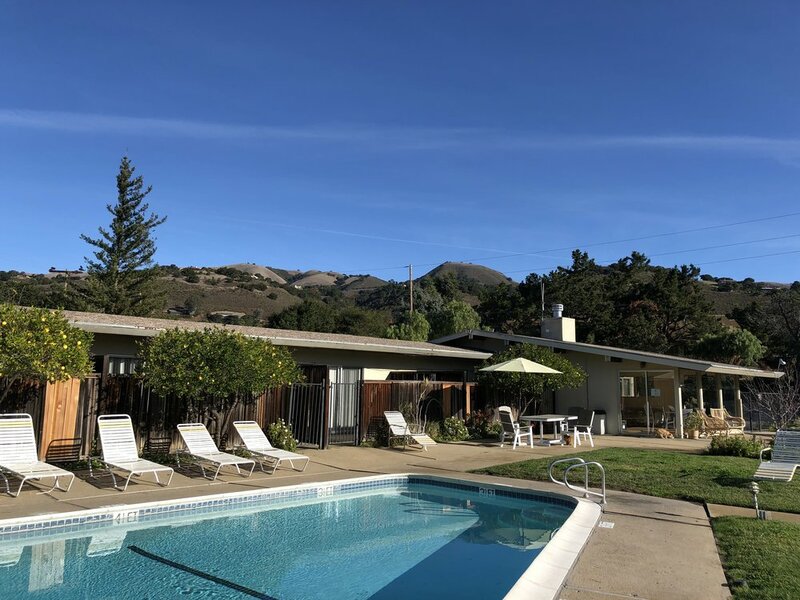 As this was a last minute addition to our itinerary, we needed to find a reasonably priced accommodation close to Big Sur. Since we would arrive at night after departing from San Francisco, we decided Carmel Valley would be a great point to rest up. Be mindful that the area closes early and most things will be closed after 9:30 on weeknights here. There are so many neighboring wineries which are perfect to explore if you happen to stay for multiple days. 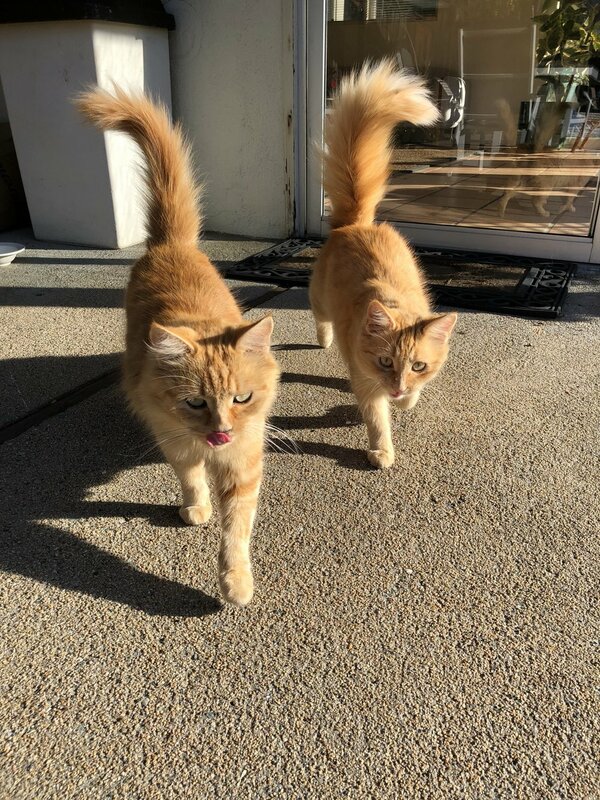 I absolutely loved staying at this B&B and the resident cats of the inn will always have a special place in my heart. The rooms are spacious and there is an outdoor heated pool that is easily accessible from every room. Big Sur Lodge is a great option if glamping in Big Sur is more your style. 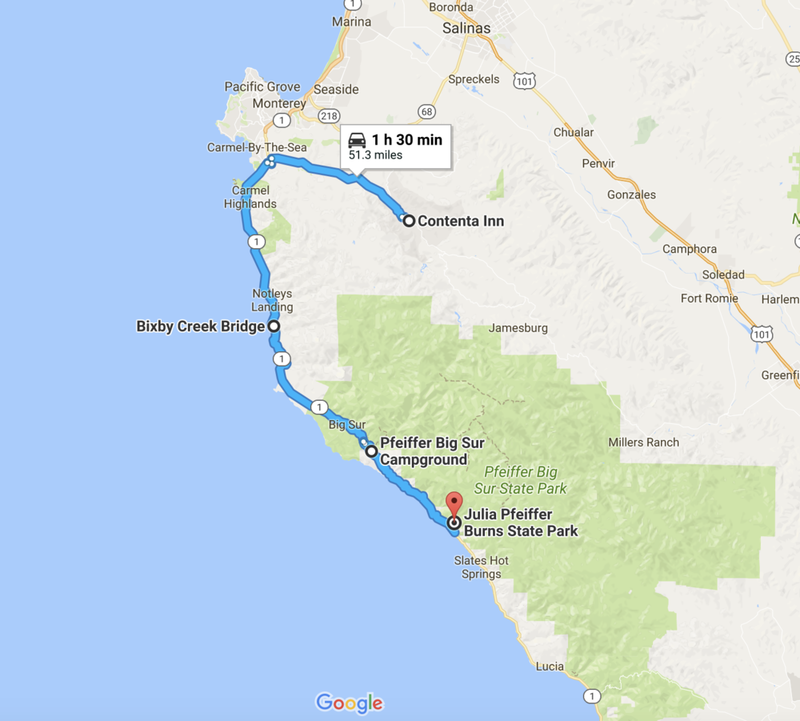 This B&B is located within Big Sur Pfeiffer State Park and is easily accessible by car. With 62 cottage-style guestrooms, this is a perfect option for a getaway in the wild with the comforts of home. The Lodge also houses a restaurant and espresso bar with plenty of dining options throughout the day in case you don't feel like cooking up your own meals. As I mentioned, the area closes early on weeknights. This led us to stop at a nearby restaurant in town, The Running Iron. If you're famished, the portions here will definitely fill you right up. Since we were snacking on Mr. Holmes Bakeshop pastries and snacks along our trip, we weren't as hungry and decided to share some entrees. Everything was delicious and hit the spot after a long day. Although we did not dine here, the menu looks fantastic. I saw so many options that I would love to have tried. Most notably of these options were the crab sliders and the coconut curry vegetable stir-fry. I assure you that the beautiful views and food should be a wonderful pairing before you head back home or back to camp. There are so many places to explore in the area and this list just scratches the surface. 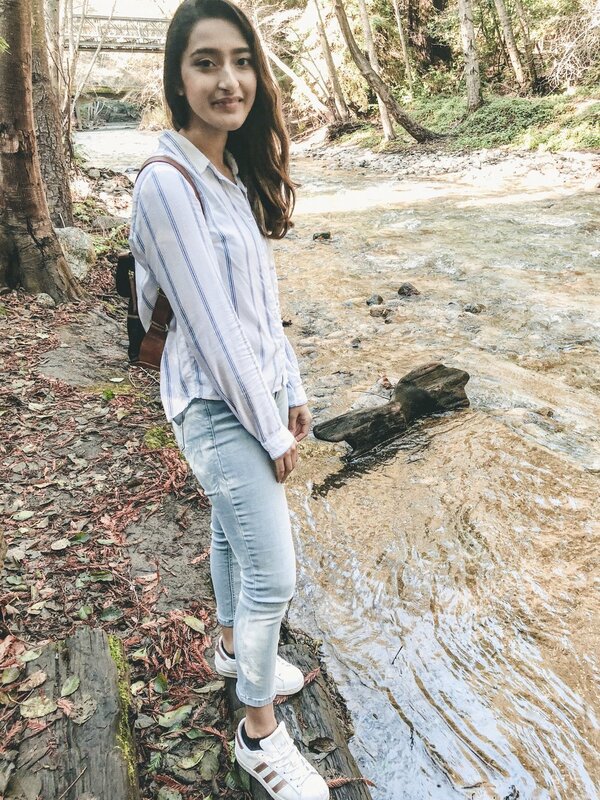 I think Big Sur definitely has a special place in my heart and I am really hoping to come back again to experience more of what the area has to offer. Until then, I hope you enjoyed following our day in Big Sur.